We are thrilled that everyone who uses our Firecat Pottery, knows they are getting unique pottery hand made by the artist. worthy of the most deserving cat lover. Before I created Firecat Pottery I was making a wide variety of one of a kind clay pieces. Then one day the cat theme took over. I found that cat lovers get so much happiness out of my cat (and other) designs, and they want to add to their collections! I was concerned that I would tire of making mostly cat items. However I have learned so much about cats and heard so many stories from loyal customers over the years, plus I keep thinking of new versions of both functional and decorative feline designs. 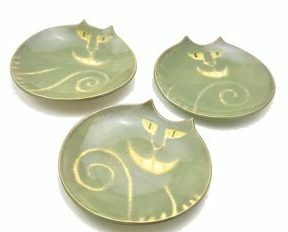 I learned cat lovers are very creative people, even if a pottery piece is purple, they may think it has just the look of their dearest pet. My work also expresses my love of the ocean, traditional botanical, and even some dog inspired pieces.